Áine Kelly-Costello is an Arts Access Advocate. She works as a community organiser with the Access Matters campaign and is interning as a digital news producer at Newshub. 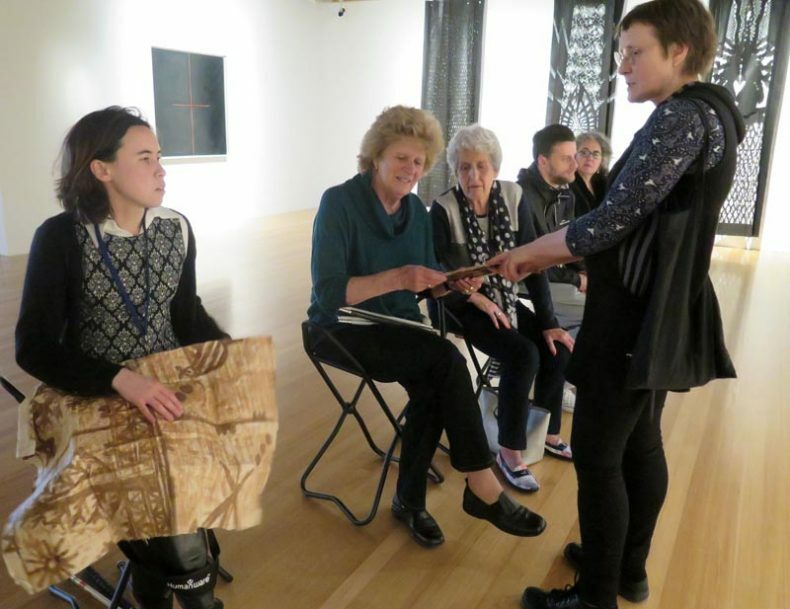 Recently, she took one of our Toi Art sensory tours, and wrote about it for Arts Access. Her article is reproduced in full below. 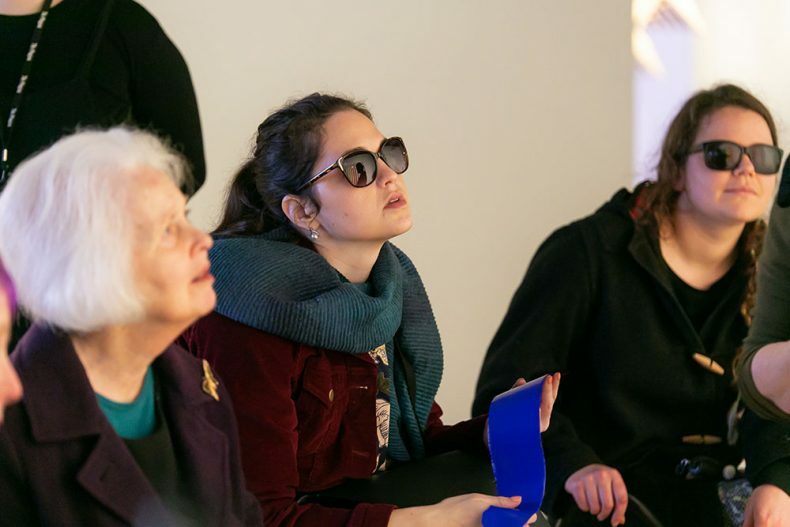 How can blind people experience an art exhibition when some of the artworks appear on screens, involve paint or can’t be touched? How can colour become meaningful if you’ve never seen it before? How can you rediscover a medium that may seem increasingly out of reach if you are blind or losing your sight? “The exhibition I’ll be describing today asks how colour, shape and pattern have captured our imaginations in the Pacific,” explains Judith as we exit the lift and head towards our first stop. Finally, we watch a clip featuring the work’s creator, Tiffany Singh. 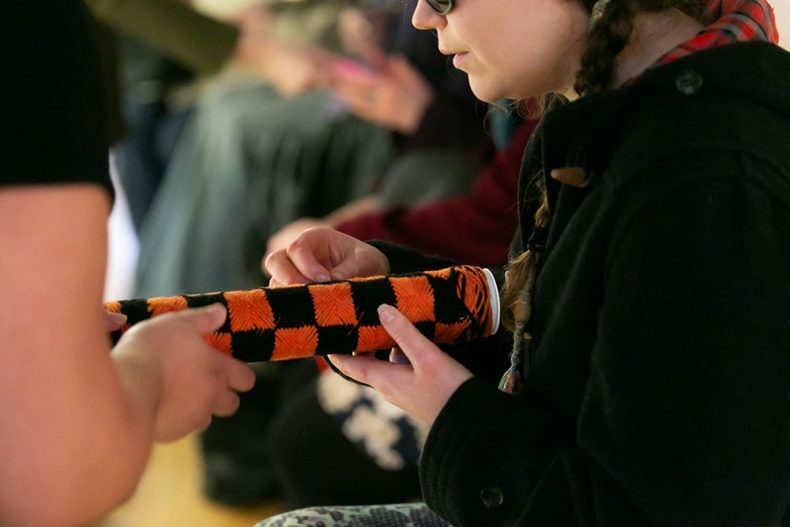 She explains what the work is all about and connects the colours represented by the ribbons with the Indian concept of the chakras, while spotlighting natural, sacred medicinal ingredients in the orbs. I am struck by the power of an artwork to bring the sacred dimension of the natural world into relief. What on earth is a paint strip? I wonder. I’m handed what feels like a piece of flexible plastic, something like one of those hanging store-entrance curtains. It turns out this strip really is solidified paint. “This pattern is called Takarangi – the Cosmos,” says Judith, handing me a small square wooden panel with a design featuring two spirals circling outwards from its centre, little triangles imposed on top of the spiral. It’s a miniature version of the actual whakairo or carving, originally created for the children’s discovery area but now serving our group well as we explore the careful detail on the wood. This article was originally published by Arts Access. its great that the people off NZ not so lucky as ourselves are not forgotten… we take our sight for granted.. thank you.